One of the best ways to light up the trail or sand dunes is with a Helmet Light. This light weight (65 gram) aluminum LED Helmet Light is so small you won’t notice it’s there. The Thumper Jockey Helmet Light utilizes the efficient and high powered Cree XML LED which puts out an amazing 1000 Lumens. 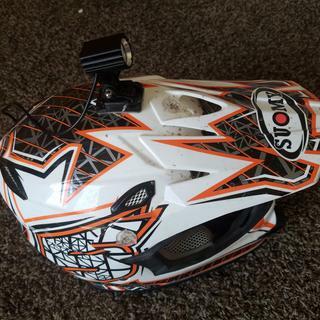 The Helmet Light comes with a GoPro compatible mount. Included is a battery pack that powers the Helmet Light for over 4 hours on high. The compact battery fits neatly into your backpack or easily straps to your chest protector. A car charger is also included to charge your battery while on the road. Helmet Light weighs only 65 grams. 4+ hours of light on high. High = 1000 Lumen, Medium = 500 Lumen, Low = 250 Lumen. Battery level meter on back of light. Awesome little light that could. Just need more of them now !! Jockey Helmet Light for the win! I was very impressed with this little but very powerful light! At first I was very hesitant on buying this light. Mostly because of the price. You wouldn’t believe how bright this little is! I get asked by everyone where I got it from. On top of that Rocky Mountain was very quick on shipping! I recived this light in just 2 days! Bough this so friday nights at the bon fires I can go rip the washes. Totally worth the money (granted i used masking tape and two mag flash lights on the front fender before). Surprised how bright it was. If you're looking for stupid amounts of light go for a light bar kit, but worth the $100. My son and I used these lights all summer 2016 and just love them. I did some long single track rides and never ran out of battery (3+ hours). Its so lightweight I can't even feel its there. I run the brightest setting when I'm out front but use the middle setting when its dusty and I'm behind someone to lessen the dust glare. Easy to adjust while riding. 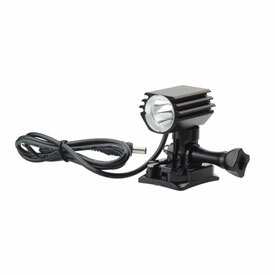 I have used this along with the Thumper Jockey bar mounted one which is awesome too, it's so nice to have this one to be able to have light where your looking and not just in front of the bike. BEST ANSWER: Yessir, I have used it two years in a row at the GutBuster 24 Hr race, both years was rainy and muddy.Great Little Light, battery life and brightness are excellent. I have the light. I would say it is “rain proof”. But I’m guessing if you submerge it in water that would fry it.